Conception Seminary College in Missouri is hosting an Encounter With God’s Call weekend April 6-8, 2019. This is a weekend for men age 17-24. Experience the real world of seminary: attend Mass, prayer, spiritual conferences with priests, hear testimonies from seminarians, take a tour of the campus along with many other activities. 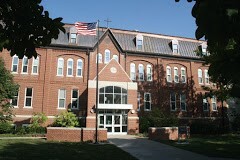 The mission of Conception Seminary College is the preparation of candidates for the ordained ministry in the Roman Catholic Church through spiritual, intellectual and character formation in the Benedictine tradition. For more information about the Encounter With God’s Call weekend or to register, please email Vocation Director Father Ross Parker or call 515-237-5050.